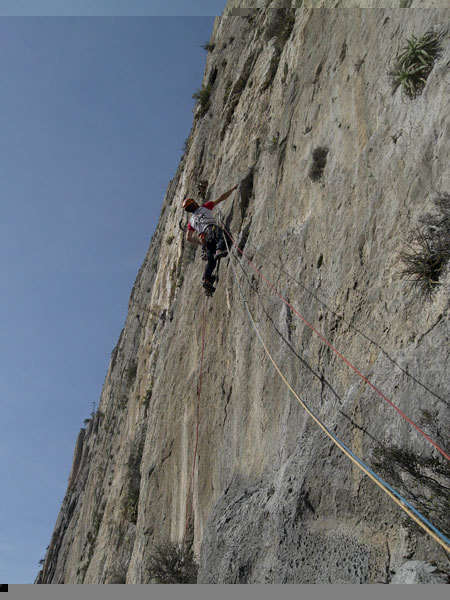 In January 2010 the Italians Alessandro Baù and Matteo Della Bordella carried out the first ascent of ‘Fiducia al sentiero’ (500m, 5.12c/7b+ max – 5.11d/7a obl.) 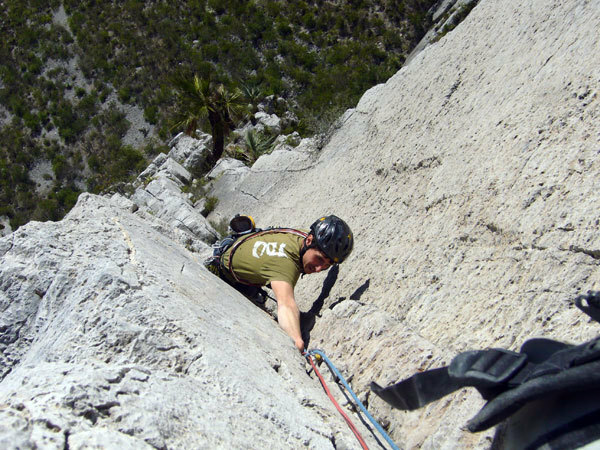 on the South Face of Tatewari in the La Huasteca Natural Park, Monterrey, Mexico. An autumn spend working and studying in New York was an excellent pretext to spend my winter holiday climbing on the American continent. Unfortunately the most famous areas in the USA and Canada, like ours in the Alps, are often too cold in winter – Yosemite, Indian Creek e Squamish – so I thought about going to Mexico which in winter offers perfect conditions. As usual the first thing one has to do is find at least one partner, and so the trip remained on hold until just a few weeks before Christmas, when finally I received an email from Alessandro Baù confirming he’d booked a ticket. Superfluous to say that I’d booked mine not even an hour later and that I’d begun to gather as much information as possible about climbing close to Monterrey. We stayed in Mexico for only 19 days, but these were 19 full days: if you don’0t count the journey, we had two rest days and so we climbed for 15 out of the 17 days. In short, we didn’t waste much time. I knew Ale fairly well and despite our the fact that we live in two different cities we’d already climbed a fair bit together and we really get on well together. We’re very similar, he too always wants to try something new, he never says no. We formed a good partnership and I think that our route is testament to this. 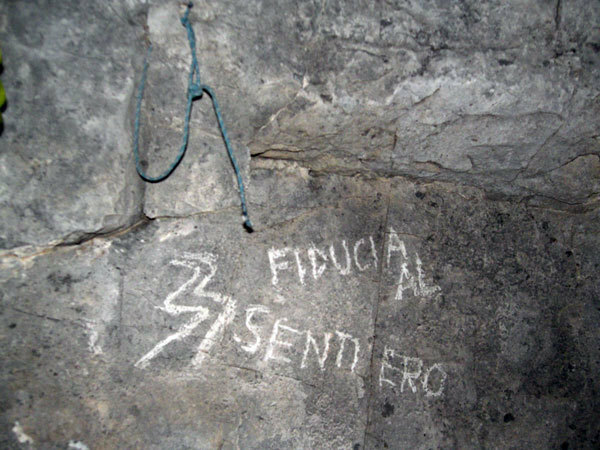 We called our route “Fiducia al sentiero”, (“Confianza en el Sendero” in Spanish) and this climbs a 500m rock face called “Tatewari”, located in the La Huasteca Natural Park, close to Monterrey. 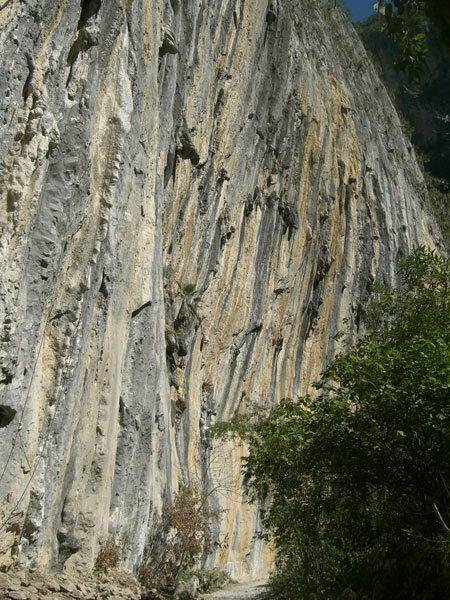 This is a compact, vertical limestone face, similar to the one in Sardinia where I’d climbed a new route. The entire face is circa 800m wide and since there are only two other routes we were able to chose a logical and elegant line up the very center, splitting the entire wall into two symmetrical halves. We spent three extremely intense days carrying out the first ascent, and with one bivvy we shared leads to establish our 10 pitch route. The first ascent was fast, extremely fast, and even if 3 days aren’t little, we only had 10 hours of daylight and the difficulties were sustained. We on-sighted 6 out of the 10 pitches using trad gear, despite the fact that it was limestone and that we had the occasional slab, while the remaining pitches were bolted. If you exclude the belays, we only placed 17 pitches on the entire route. I personally put to good use the experience gained in the Shawangunks this autumn, while Ale felt at ease on this terrain thanks to the trad routes in the Dolomites. Alessandro Baù. After the first ascent, while we were descending and dodging the cactus, we already had our minds focussed on the first ascent, on the few bolts we’d placed… and the desire to return to the route grew and grew! We spent New Year’s Eve and a couple of days at Potrero Chico, where the crags and multi-pitch routes are climbed by a few Europeans and above all by American Gringos. Nice limestone walls which offer varied and interesting climbing, slabs, tufas, overhangs… in short, a great place to have some fun! We climbed at Fin De Semana, The Surf and Outrage Wall, while the campground at “La Posada” is worth a visit because its communal kitchen is a hotbed of climbers of different cultures and nationalities: relax, trashed finger tips, music, mags, and odours of other cultures boil down into a chaotic mix. We then returned to Huasteca, the place which we felt a bit as if it were our home. 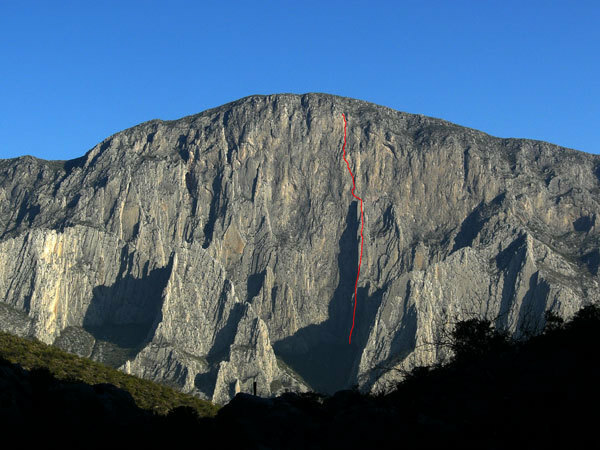 As it happened, we repeated the route on the coldest day of our three-week stay in Mexico… damn, we couldn’t feel the micro-edges, so much so that I took a nice whipper on the hardest pitch. And even if we completed the abseils in the dark, it all ran smoothly and we completed the first ascent, my first route with bolts. Monterrey at 1400m altitude. “Las Animals” awaited us, an incredible beautiful crag, 250m wide and 100m high, 15° overhanging, with truly impressive tufas of all shapes and sizes jutting out all over the place. 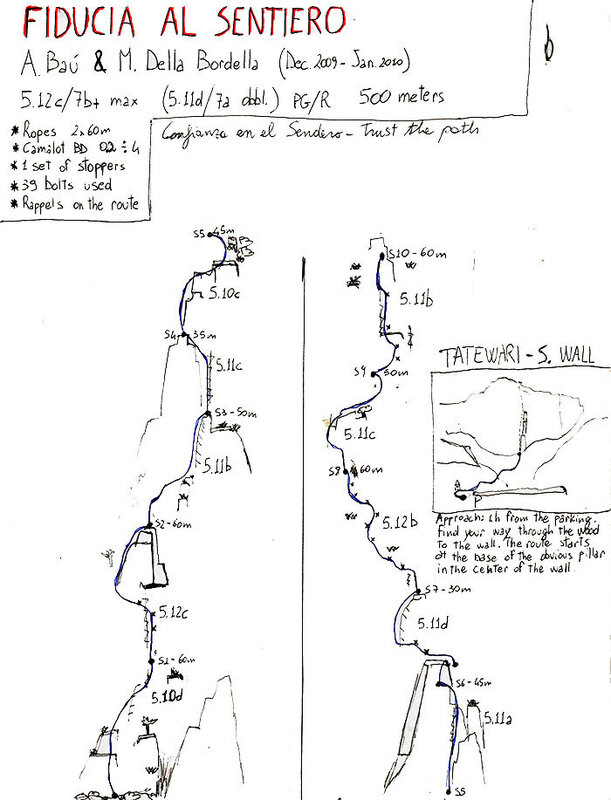 At present there are routes from 6c to 8b+, no chipped holds and the possibility to bolt much more… but they’re no walkover! On our last day we visited close-by Telecote Cave where we completely killed our forearms. 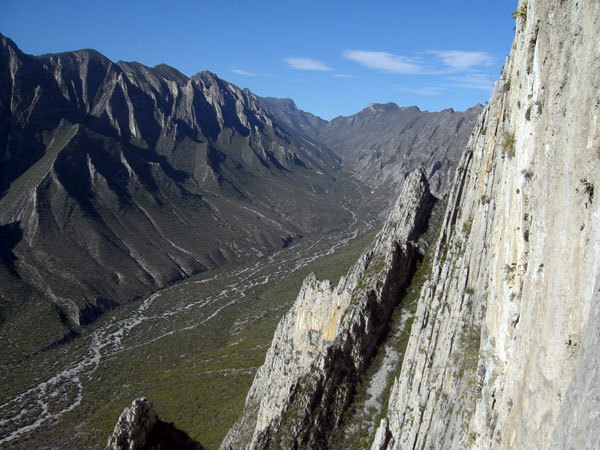 in conclusion, Mexico during the Christmas period really is a good option, both for single-pitch crags and engaging multi-pitch first ascents; there is still much virgin terrain on Tatewari.